Learn how to build mobile apps without writing code. 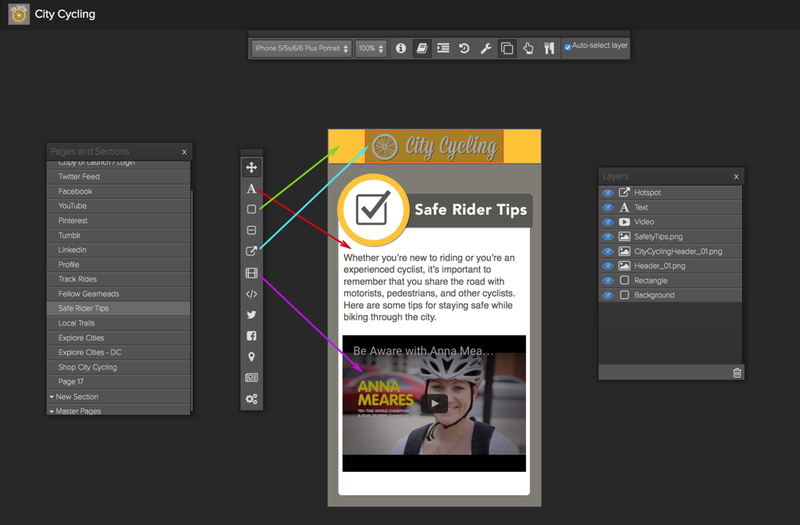 To design screens in your app, you'll open the studio editor and add various layers from the toolbar. Here's a quick introduction to each of our layer tools, and how you can use them to design screens in your app. The Text Layer tool allows you to add sections of text to your screen. You can do a lot with the Text Tool - check out our documentation on working with text in your app. The Rectangle Layer tool allows you to draw simple rectangles to create backgrounds, headers and footers, menu elements, and more. Using the Hotspot Layer tool, you can create touch-enabled spots in your app screen, then link them to other screens, external websites, or menu functions using Master Pages. Want to learn more about working with hotspots? Check out our documentation on adding functionality to your app. The Audio / Video layer allows you to add audio or video files to your app. You can upload your own files, or link to a file hosted on the web (on YouTube or Vimeo, for example). Check out our documentation on adding audio and video files to your app. You can do a lot with the HTML Embed layer. It's used to embed any web page, or HTML code. The most common use is to embed a web page - for example, you could embed an existing form from your website, your Instagram profile, a map created with Google Maps, or your blog. This documentation will show you how to add a website to your app. Note: you'll need to preview any website in your app using App Press Now to see how it will render. The preview shown in the studio editor will not be accurate. Just as you'd expect, Twitter and Facebook layers allow you to add your social profiles to your app. The Map layer tool works with Mapbox, a service for creating beautiful custom maps. You can add custom maps to your app - learn more about our Mapbox integration here. Finally, the News Feed layer allows you to add and customize a news feed. This feed can be quite complex to set up, but our team is happy to help if you're interested.